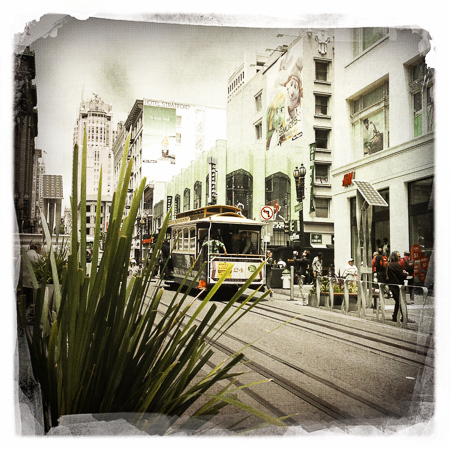 The cable cars’ routes include one up and down Powell Street, turning around at the BART station of the same name. iPhone photo via Hipstamatic. I was planning primarily to shoot architectural sights while there (and some of those will be featured in a later post). 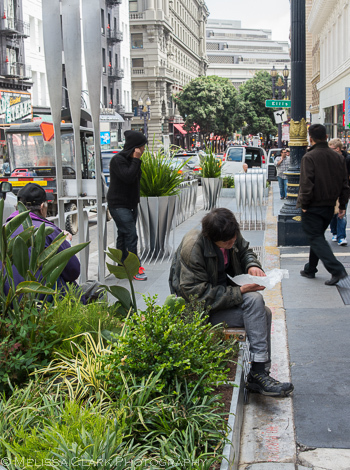 Imagine my surprise when right outside my door was an innovative landscape project by Walter Hood, the Powell Street Promenade. 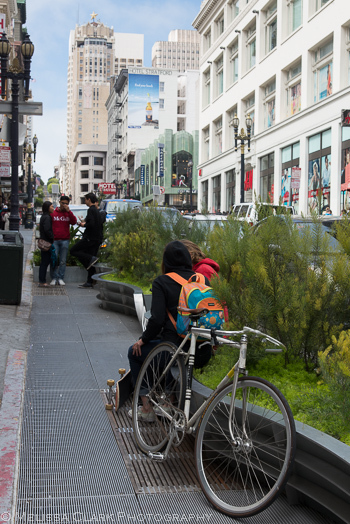 Underwritten by Audi at a cost of $890,000, the Promenade consists of eight six-foot-wide “parklets,” carved out of traffic lanes and abutting the sidewalk. Given the huge numbers of tourists travelling Powell Street on a regular basis, having an attractive, protected spot to step out of the flow of people and chat with friends, sit down for a bit, or park your bike while you make a call or stop in a store is a great idea. These aluminum structures can be used as little tables for a snack or to rest your packages on. A bike rider takes a break to chat with a friend on the Promenade. There are a few built-in benches, which always seemed in high demand. A pedestrian takes a break, out of the flow of the constant sidewalk traffic. For more details on this project, check out this blog post from the San Francisco outpost of Streetsblog. 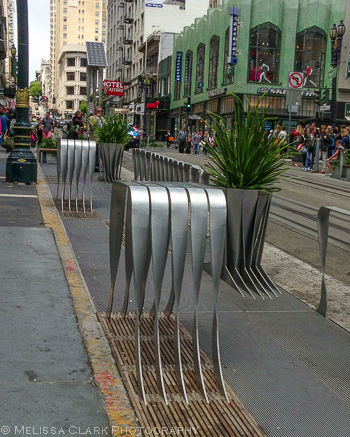 And the next time you’re in the City by the Bay, in the vicinity of Union Square, be sure not to miss this innovative design feature on Powell Street! 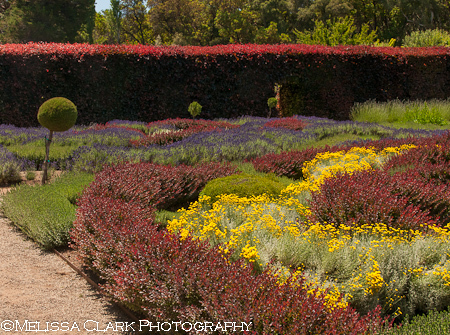 When I was in the Palo Alto area in June this year, I visited Filoli again (as well as the Elizabeth Gamble Garden). It was blazingly hot, and I wasn’t sure I would get any good images because of the sun and time of day. So today’s post is sort of an ode to my B&W circular polarizing filter, as you’ll see. I knew Filoli’s gardens were formal, for the most part. But on my prior trip I hadn’t ventured far enough to discover its Knot Garden. 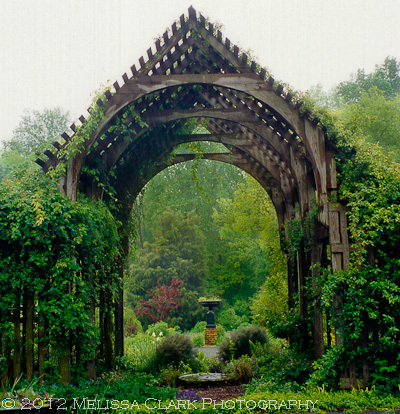 Located just beyond its rose garden area, this was no ordinary knot garden. 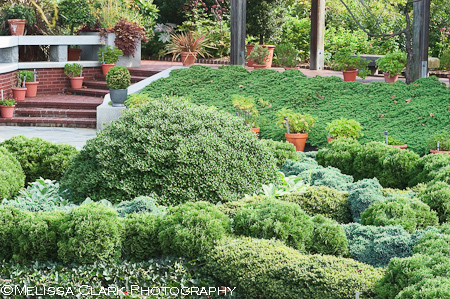 All the knot gardens I had seen before were clipped boxwood shapes. The one at Broughton Castle was clipped and had roses inside the spaces. 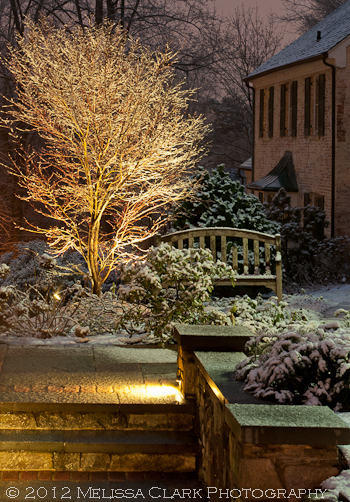 The walled knot garden on the south side of the castle, known as the Ladies’ Garden, was established in the 1880s on the site of the sixteenth century kitchen. The fleur de lys beds are planted with Rose ‘Heritage’ and Rose ‘Gruss an Aachen’. Oh so tidy and veddy British, don’t you think? Closer to home, I’ve seen a knot garden at the National Arboretum, with its edging plants somewhat more loosely clipped. 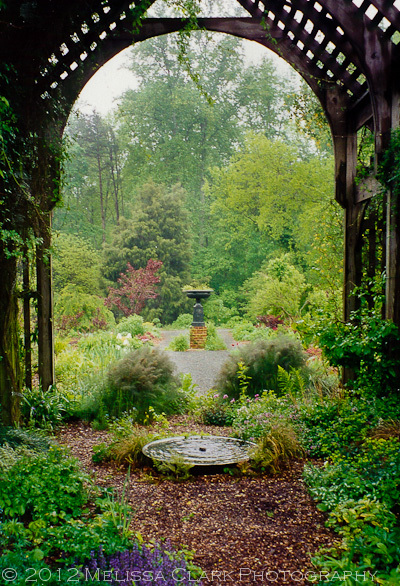 So at Fioli, I was delighted to come across a knot garden composed of barberry, lavender, santolina, and little rosemary balls trimmed like lollipops – all viewed against a hedge of copper beech. Originally planted in 2007 by a local garden club or two, I’m not sure its shape is as tidy as the original plan, but I absolutely loved the sweeps of lavender, just coming into bloom. 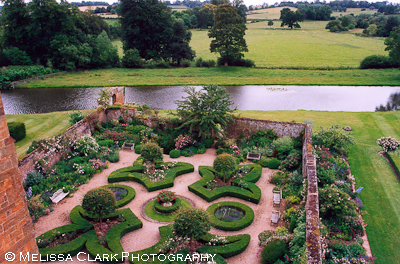 Unfortunately, I wasn’t able to get any elevation when shooting so the shape of the knot garden isn’t that evident from my photos. And the sun glared off the barberry leaves mercilessly. Here you can get an idea of the sweeps of barberry, santolina and other plants used in the Knot Garden at Filoli, with the copper beech hedge in the distance. The sun’s glare on the barberry leaves is very evident. 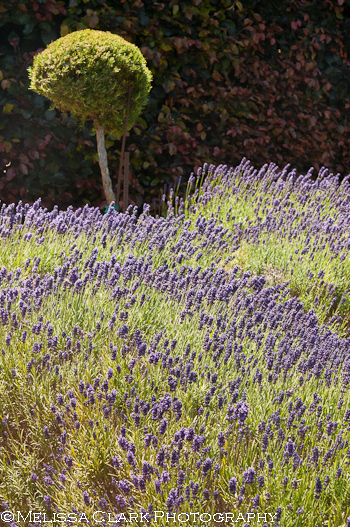 A more tightly-cropped view of the same scene, with three of the rosemary standards visible from left to right, ending at an opening in the hedge. Finally, I brought out the polarizer for my 24-120mm lens, and used it to cut the glare on the barberry shrubs. Here’s the result. Now the barberry leaves, while a deeper red due to the polarizer’s effect, have lost their glare. And I like the line of the plantings as they lead your eye back to that little rosemary standard. 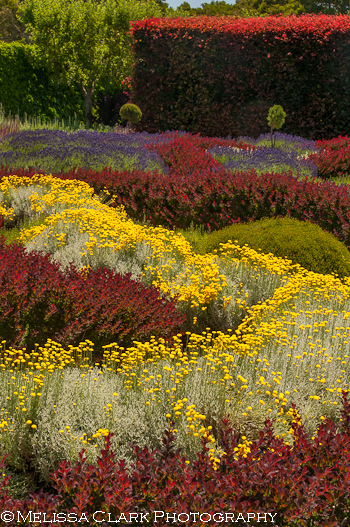 For more information on Filoli’s Knot Garden, click here. I have to say I didn’t experience the layout as two separate shapes as shown in this description, but gardens change over time. And I loved seeing the concept updated for a California climate! While in Paris in August, I stayed in an area called the Marais, which straddles the 3rd and 4th arrondissements. Scattered here and there, within easy walking distance, are buildings called “hotel particuliers,” many of which have large, imposing facades fronting on the street. For example, the Rodin Museum, subject of an earlier post, is housed in the Hotel Biron. Behind their facades, most hotel particuliers have a courtyard, and sometimes, like at the Rodin, a garden behind the building. Closest to our apartment was the Musee Carnavelet, two “hotels” that now serve as the museum honoring various periods of Paris’s history. 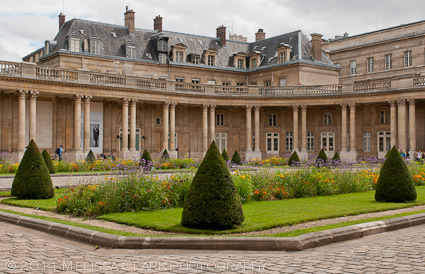 Passing through the outer gates, I found a courtyard embracing a statue of Louis XIV, and the entrance to the museum. Cretin that I am, I breezed through the museum in record time, in search of the “garden” of the hotels, which I had seen in a book before I left home. Le voila! A view of the garden of the Carnavalet Museum in Paris, from above. 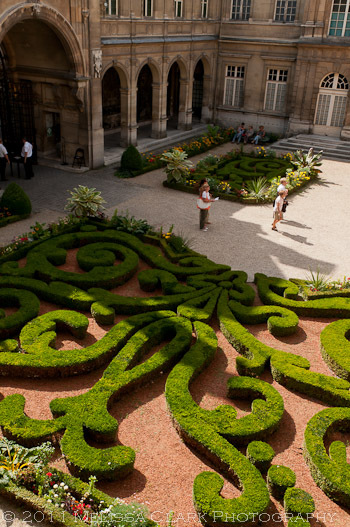 The French do love boxwood parterres. There is a second, smaller vegetable garden area, in a different part of the site. Summer annuals softening the boxwood parterre plantings. 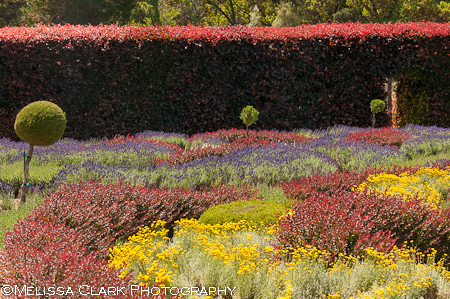 I liked the way the summer annuals helped brighten up the otherwise very formal boxwood parterres. I’m not always a fan of a mix of really strongly-colored plants together – but in this case it worked. This approach was also in evidence when – earlier in my stay – I visited the Hotel de Soubise during a walking tour of the Marais. Formerly the residence of French dukes and princes too numerous to count, it’s now the Museum of French history. 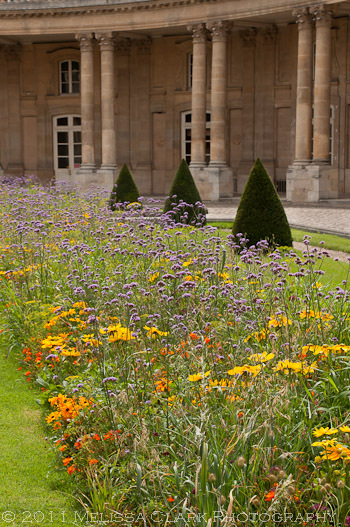 The courtyard, or “cour d’honneur,” somewhat stark in the winter, sported brightly blooming swaths of summer annuals when I was there. The Verbena bonariensis was an especially nice addition. 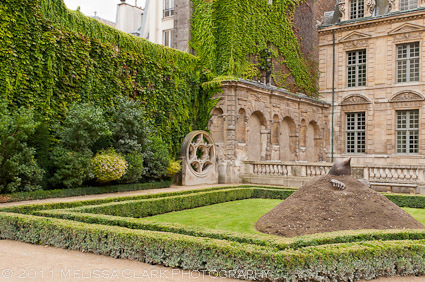 The one other “hotel” garden I visited was that of the Hotel de Sully (also in the Marais). 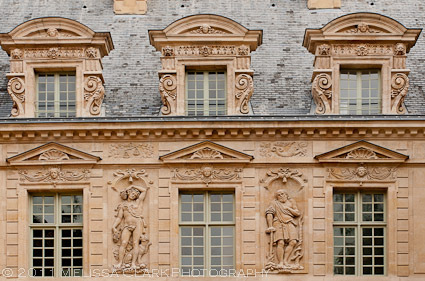 A portion of the facade in the first courtyard of the Hotel de Sully, with beautifully intricate carvings. Unlike the Soubise or Carnavelet sites, here I found no annuals to liven up the conical yews and boxwoods. But in their place, something even more interesting: in a classical formal garden, a freestanding stone lattice on the right side as you enter, and a “sculpture” of a mole (or badger?) encased in soil. There was no sign or any kind of information about the piece, which I can only assume is temporary. The circular lattice and the earth-bound mole (?) in the Sully's orangerie. For a look at another art installation in this garden, called “Bee’s Dance,” which apparently I missed (more’s the pity), click here. 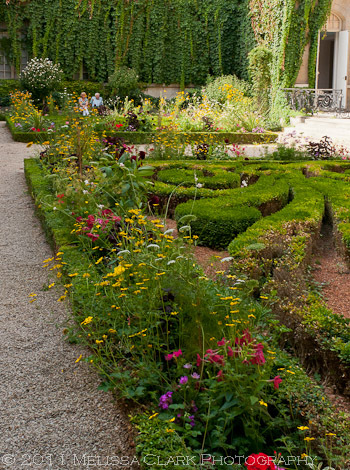 And be sure to explore these hidden gems if you’re in Paris in the spring, summer or fall! Next post – on to Oxford.